Product #21427 | SKU 9320 | 0.0 (no ratings yet) Thanks for your rating! The MOTU 16A - Thunderbolt and USB Audio Interface With AVB Networking and DSP (16x16, Line) is designed for studio recording, installed sound, and live sound reinforcement applications such as mixing a band in a club or music venue. 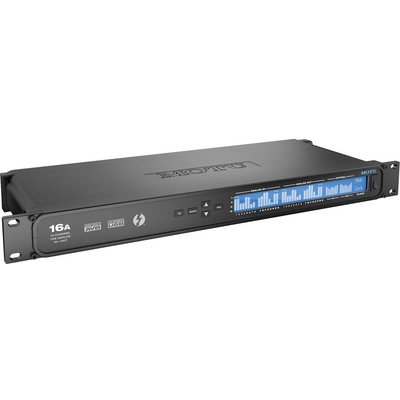 The 1U 19" rackmountable devices features sixteen balanced line level inputs and sixteen balanced line level outputs over 1/4" TRS connectors, 2 x 8-channel ADAT optical, and RCA S/PDIF (with sample rate conversion), for a total of 32 inputs and 32 outputs. Additional I/O can be added to the system through AVB networking. The audio interface utilizes ESS Sabre32 Ultra converters to provide a dynamic range of 123 dB (A-weighted 20 to 20,000 Hz) on balanced TRS analog outputs, a THD+N rating of -110 dB, and a total system latency of 32 samples (0.66 ms) while recording at up to 24-bit 192 kHz resolution. A front panel backlit 324 x 24 LCD provides detailed metering for all analog and digital I/O as well as provide a GUI for adjusting hardware settings. Using Thunderbolt connectivity, the audio interface can stream 128 audio channels in and 128 channels out to the interface's physical outputs, the DSP-powered 48 digital routing matrix, or AVB audio network streams. The interface can also use high speed USB 2.0 (3.0 compatible) using class compliant drivers to work with most digital audio workstations. The 48-channel digital mixer can mix physical inputs on the interface, audio channels from your host computer software, AVB audio network streams, or mixer outputs. It features seven stereo auxiliary busses, three groups, a reverb bus that can serve as an alternate 4th group, a main mix bus, and a separate monitor bus that can function as a solo buss. The mixer includes 32-bit floating point precision DSP-powered models of three British analog console EQ profiles, a classic compressor module with optional peak/RMS operation, and a model of the legendary Telextronix LA-2A optical leveling amplifier with automatic gain control (AGC) characteristics. Each input channel strip features a high-pass filter, a gate, a four-band parametric EQ, and a compressor. The device's digital routing matrix allows you to route any source signal such as an analog or digital interface input, computer channel, mixer bus output, or network stream to any destination such as an interface output, host software input, mixer input, or any other device (or computer) on the AVB network. A single input or stereo pair can also be split and sent to multiple destinations. The first of its kind, this interface features an AVB Ethernet port that adopts the AVB industry networking standard for transporting high-bandwidth, low-latency audio and video over Ethernet. It was developed by the IEEE and enables connection to a second MOTU AVB audio interface (1248, 8M, or 16A) via a CAT-5E or CAT-6 Ethernet cable. The standard is open meaning it is not proprietary and will allow for open interoperability across different devices and brands. The system can be further expanded through connection to a MOTU AVB Switch (sold separately), for five total devices and the capacity to stream over 512 channels on the network. Sixteen 8-channel network streams may be broadcast while simultaneously listening to sixteen 8-channel network streams. The AVB network provides its own network-wide time base for phase locking all connected devices and also allows one of the connected devices to be assigned as the master clock. An added benefit of the AVB network standard is the automatic device discovery for self-configuration, 100 meter cable runs, as well as the system's Stream Reservation Protocol which provides guaranteed Quality of Service (QoS) and an uninterrupted point-to-point network connection. The audio interface's on-board DSP, mixing, device settings, and network audio routing can all be controlled through a web application running on a web browser from a laptop, tablet, or smartphone connected by wire or Wi-Fi to your local area network. This allows the interface to be controlled using Mac, Windows, Linux, iOS, and Android devices provided they share the same network. By connecting an Apple Airport or other Wi-Fi router directly to the interface with a standard Ethernet cable, the mixing and DSP controls of the interface can be managed using a smartphone or tablet, without the need for a computer. This is useful for situations such as mixing live sound. A total of up to 12 independent stereo mixes can all be independently controlled by different engineers or musicians via Wi-Fi connected iPhones or iPads. The device includes a collection of quick setup presets designed for different applications in the studio, on stage, or for installed sound such as a recording interface or network snake. Presets can be customized using the digital routing matrix as well as saved for future recall.